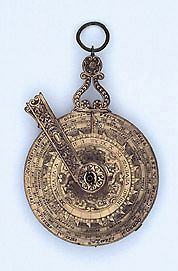 The use in this nocturnal and sundial of gilt copper is unusual for the period, except for the work of Erasmus Habermel. Another unexpected feature is the reversible plate on the sundial face, which has been given a raised rim to accommodate it. The angle measuring scales on the reverse of this plate could have been uses with the sights of the 'trigonus' from the sundial, and the instrument can be taken apart and re-assembled for this purpose. Ingenuity and diversity were prized features of mathematical instruments.